Have you ever wanted to start a blog, but you're unsure where to begin? Come to the Writing Center's Blog-O-Rama writing group. Learn how to write blog posts, share content with other bloggers, and develop your online writing skills and style. 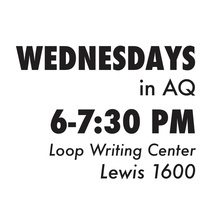 Blog-O-Rama meets on Wednesdays from 6-7:30 PM in the Loop Writing Center, Lewis 1600. Bring yourself and your blog ideas!